Our institutional research maintained a BUY rating on CIMB with a RM9.58 target price despite a seasonally weaker 1Q2011 results. This is mainly due to its strong proxy to economic growth and active capital markets, robust prospects of Indonesia banking industry and growing regional universal bank platform. Since staging a breakout above its downtrend line (DTL) in early May, CIMB has been consolidating above the mid Bollinger band and 30-d SMA. There could be a start of a new rally soon once the MACD gains further strength. 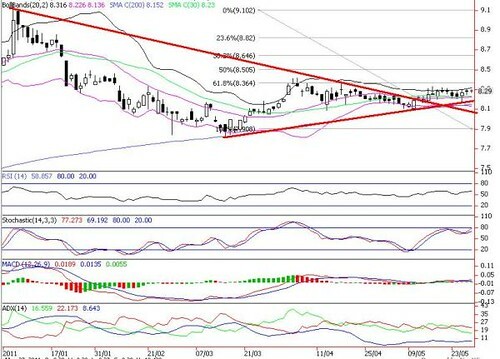 Immediate resistance targets are RM8.36 (61.8% FR) to RM8.50 (50% FR), followed by RM8.82 (38.2% FR). Uptrend will remain intact if CIMB is able to consolidate above the lower Bollinger band of RM8.13. Cut loss below RM8.05 (2-month low).